Thursday, November 20: This morning, I wake up with a terrible lower back ache in addition to the stomach cramps I’ve been having for two days. 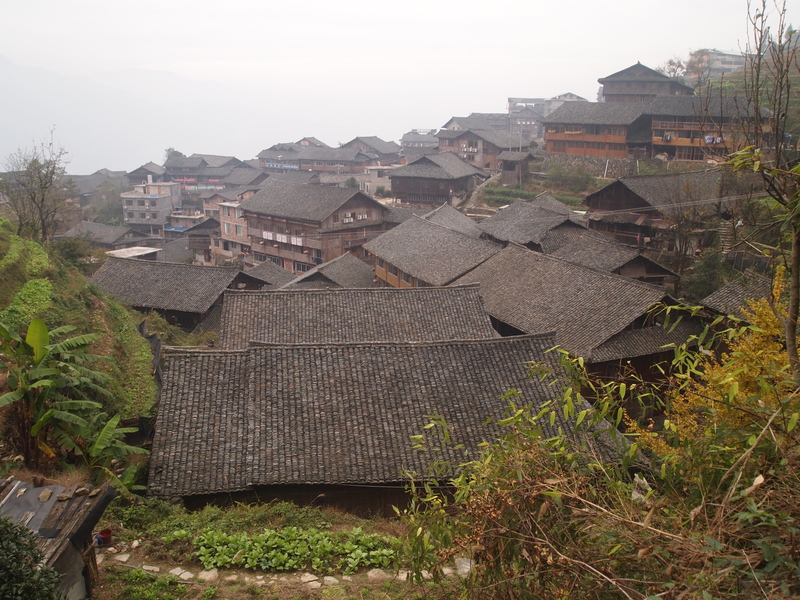 I don’t know if I slept in a contorted position or if it’s a result of sitting all day yesterday on trains and buses and then walking up the steep path, and then back down and up again, to Ping’An village. I’m not usually one to get terrible back aches, but this one is bad. I can hardly move! 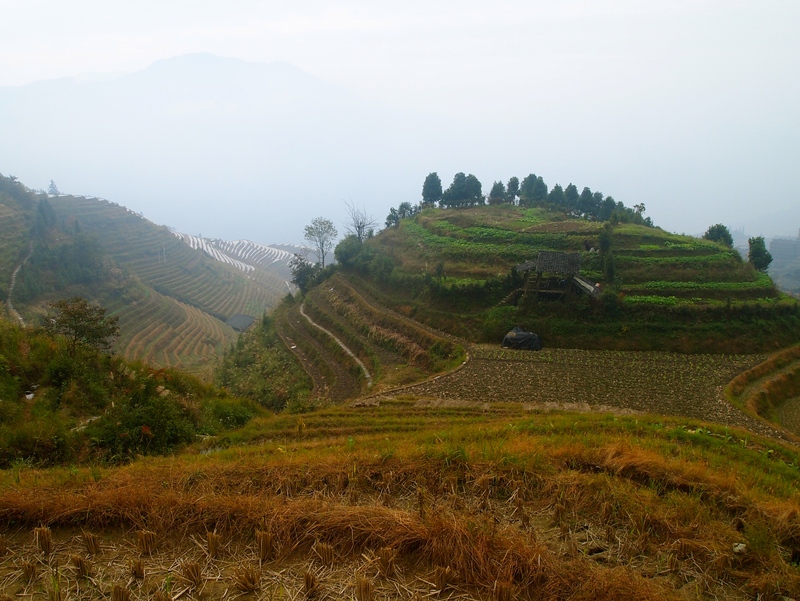 I’ve scheduled a 10:00 hike through the rice terraces with the spry little lady guide, and I wonder if I’ll be able to do it at all. I walk out onto my balcony and check out the village below. 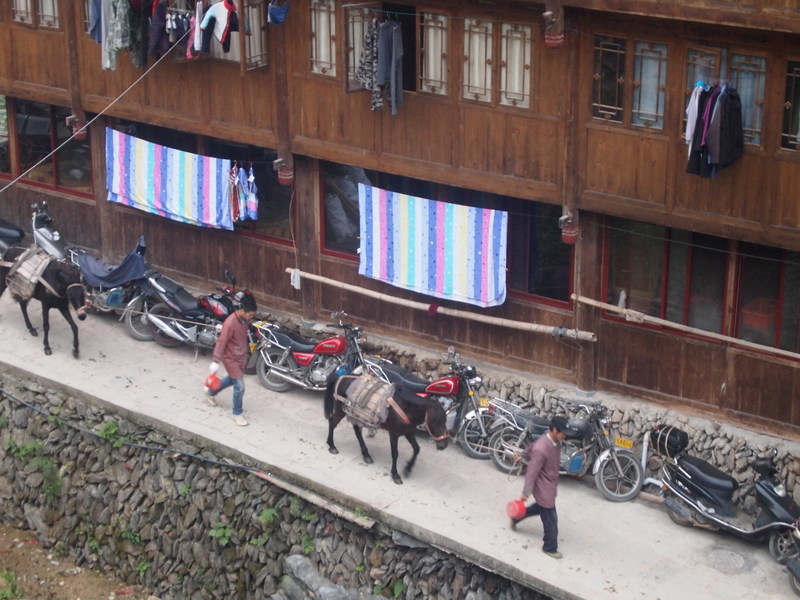 I’m on the fourth floor, so I have quite a nice view of the busy Zhuang villagers leading their horses up and down the path laden with logs and bricks and all manner of construction materials. 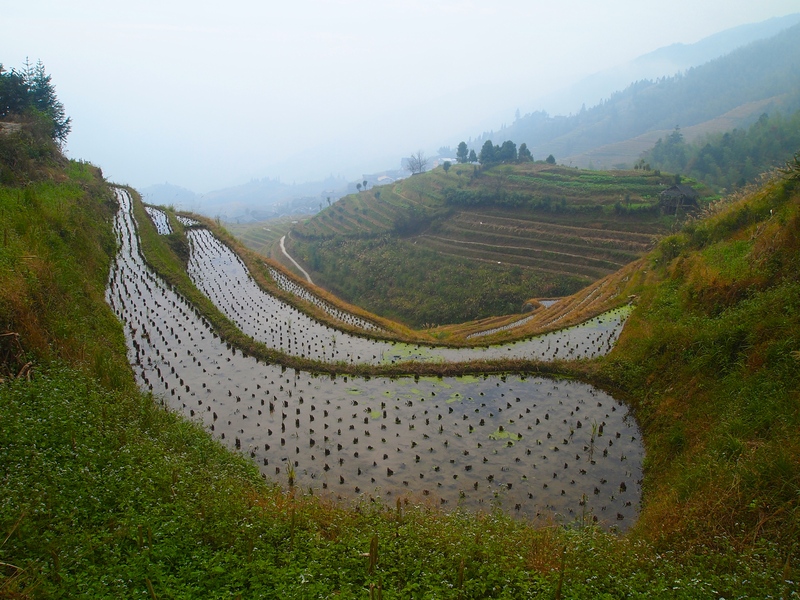 The Ping’an Terraced Fields are located in the Longji Terraced Fields Scenic Area in Longsheng County, which is 100 kilometers north-west of Guilin City. 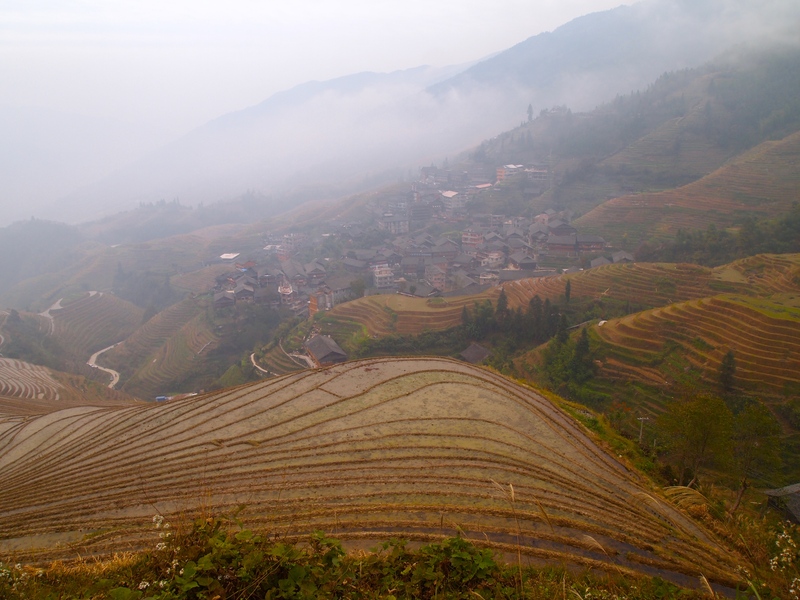 Longji Terraced Fields consist of three main villages – Jinkeng Red Yao Village, Ping’an Zhuang Village and Longji Ancient Zhuang Village. 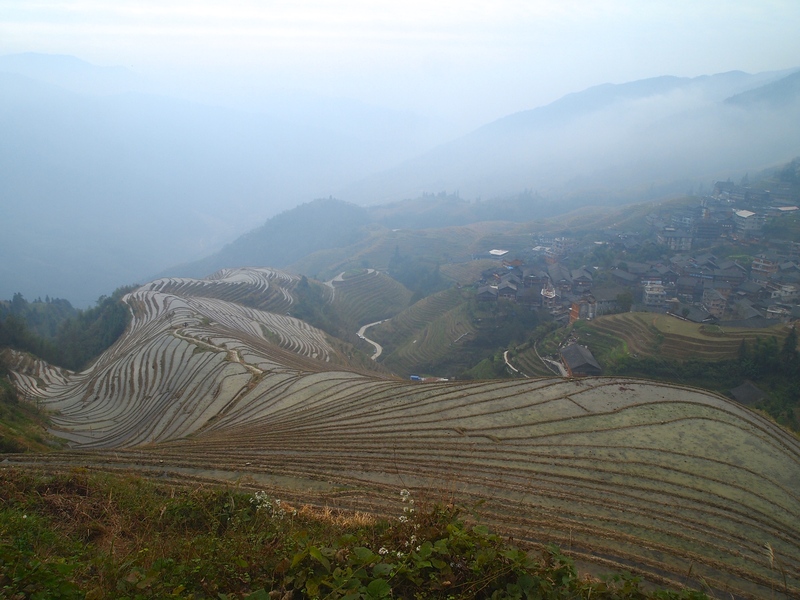 When talking about Longji Terraced Fields, it is generally considered to be Ping’an Terraced Fields, the core tourist area of Longji Terraced Fields. 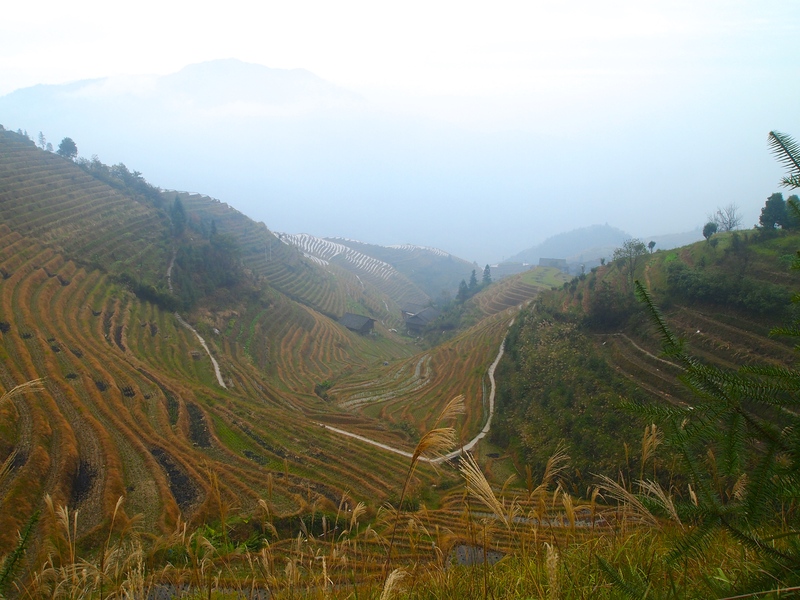 The altitude of the Ping’an Terraced Fields is from 300 – 1,100 meters above sea level. 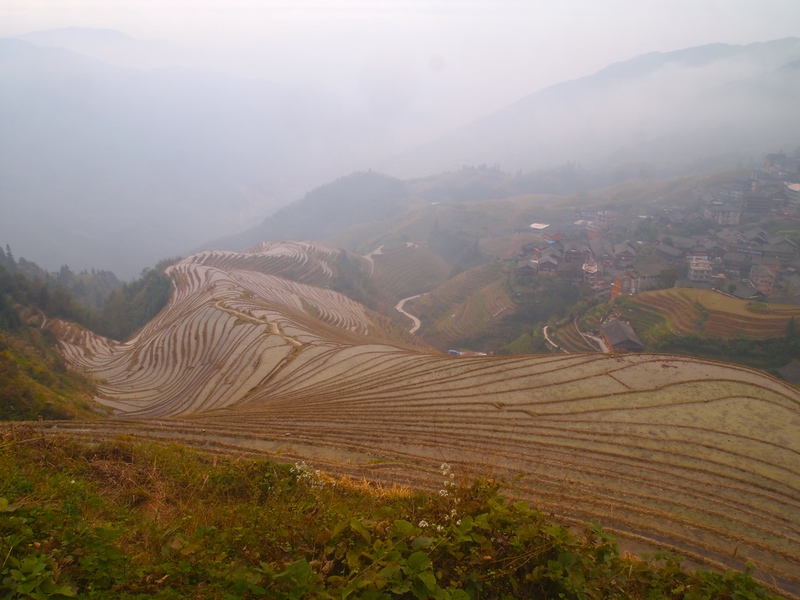 This area was first cultivated in the Yuan Dynasty (1271-1368) and finished in the early Qing Dynasty (1644-1911) with a history of more than 650 years (China Highlights: Longji Ping’an Terraced Fields). 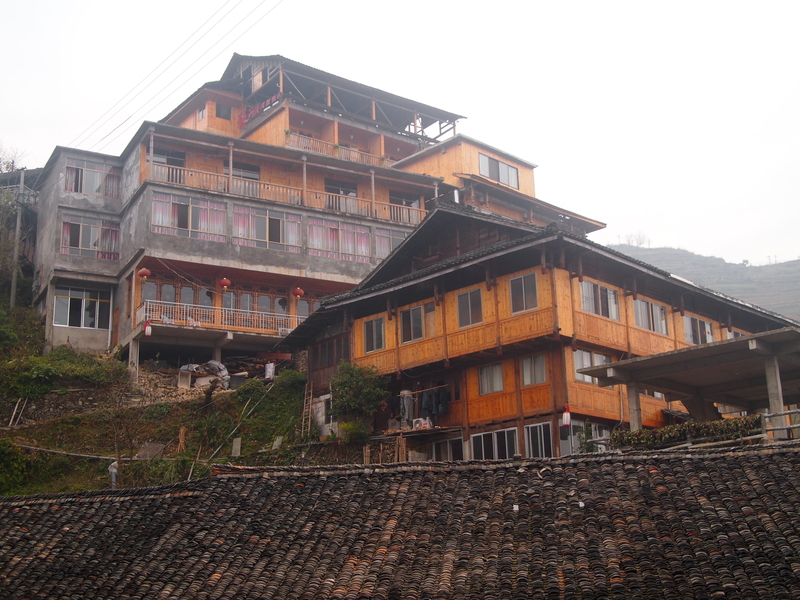 Ping’an Zhuang Village accommodates more than 50 families with over 200 people. 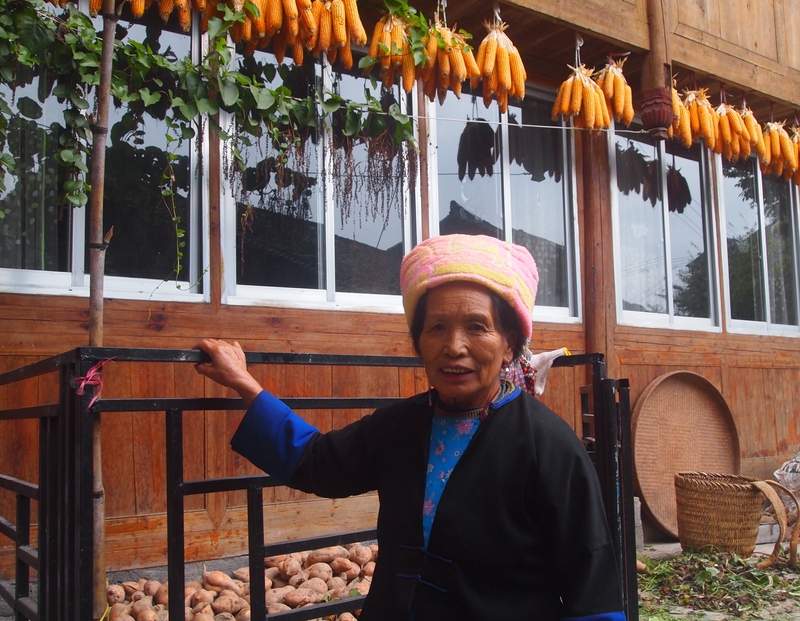 Most of them are Zhuang people and some are Yao people. 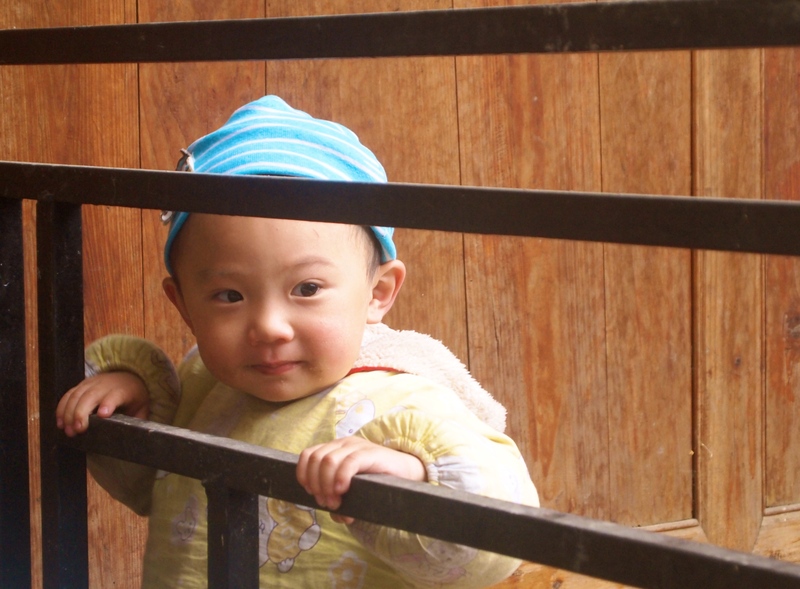 The Zhuang minority nationality is the main nationality in Guangxi Zhuang Autonomous Region. 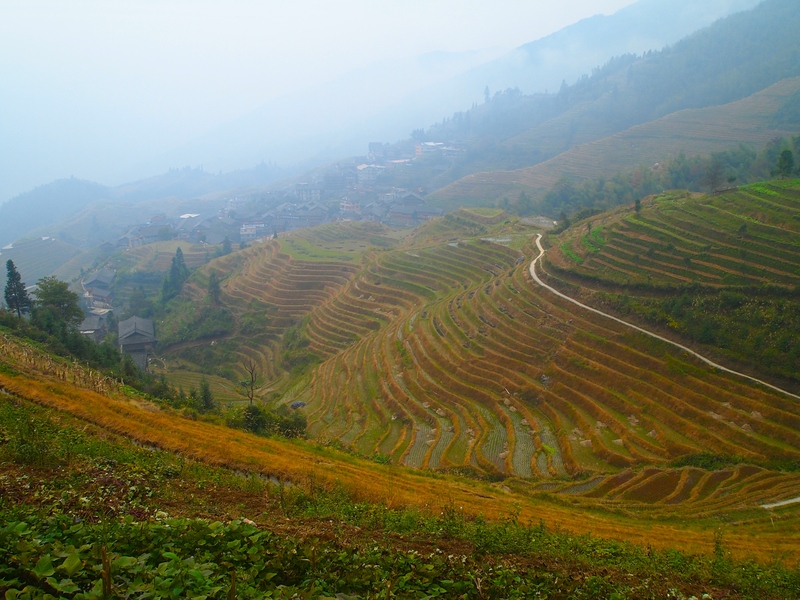 One third of the population in Guangxi is comprised of the Zhuang people (China Highlights: Longji Ping’an Terraced Fields). I consider canceling my hike because with an iffy stomach and the pain I’m in, I figure it will be a miserable hike. I don’t know if there will be bathrooms along the way for my stomach issues, and I could make my back worse and be laid out the rest of my holiday. However, I don’t have limitless time off, and I’ve come all this way!! I can’t possibly just lie around in bed nursing myself back to health. I figure the fresh air will do me good and that I’ll just walk out the pain. I go down to the lobby to eat a Western breakfast of scrambled eggs, bacon and toast and I tell the receptionist about the leak in my bathroom ceiling. She picks up the phone and makes a call and says they will have to buy a new faucet. I tell her it’s not the faucet that’s leaking but it must be some pipe in the ceiling because the whole ceiling is leaking all over the bathroom and onto the carpet in the room. She sends someone up to inspect while I’m eating my breakfast and then she tells me they will need to replace a whole pipe. She asks if I’d mind switching to a standard double room, with a Western toilet (! ), for half the price of what I’m paying. This will be my third room switch since I arrived, but I’m happy to switch to the cheaper room. I tell her I tried to book the standard double on C-trip but it showed only the family room or the dorm rooms were available; I preferred the standard double from the beginning. She’s perplexed as to why C-trip showed the rooms as being booked as it’s obvious there is hardly anyone in the hotel at this time of year. No matter, I move all my stuff back to the second floor and settle in, taking a nice hot shower to soothe my back before heading on the hike. At 10:00, my guide appears at the hostel and off we go. She’s as happy as she was yesterday when she hauled my bags up that steep mountain. I’m inspired by her happy nature and figure if I’m going to be in pain on a hike, she’s a good one to be with for her caring and kindness. My Zhuang porter from last night and my guide for today. She’s the nicest and most cheerful woman imaginable! We begin our uphill walk through the village and when we come to a crossroads she asks if I’d like to see Viewpoint 1 or Viewpoint 2 first. I point in the direction of Viewpoint 1: Nine Dragons & Five Tigers, thinking we may as well start at the beginning. My guide is strong and healthy, and with the way I’m feeling today I feel older than she is! It’s kind of depressing, but I figure I will do my best to keep up with her. She stops to speak to a friend of hers along the way, and to admire the little grandchild. I like the corn drying along the front porch of the house. 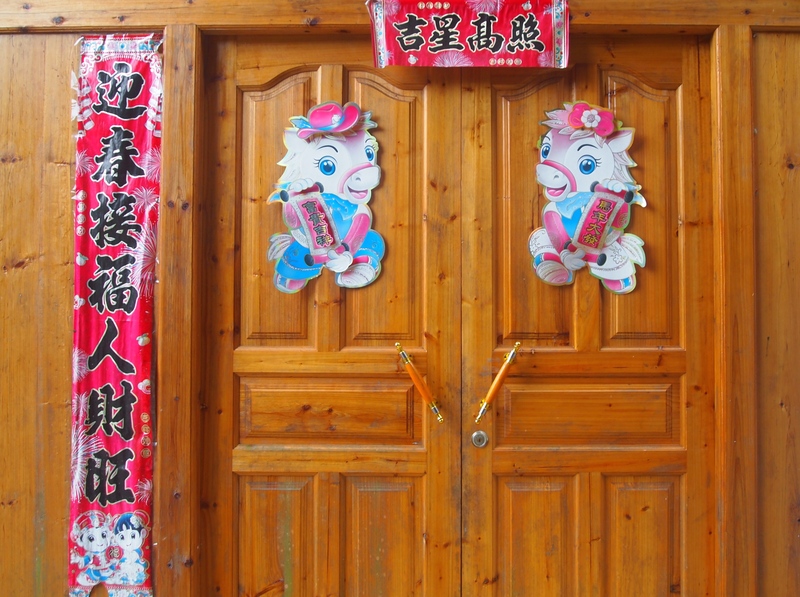 When I was in Yangshuo, Audrey told me that people often keep the good luck symbols from Spring Festival on their front doors all year round, even though they start to look tattered after a while. They’re afraid to take them down because they supposedly bring good luck. 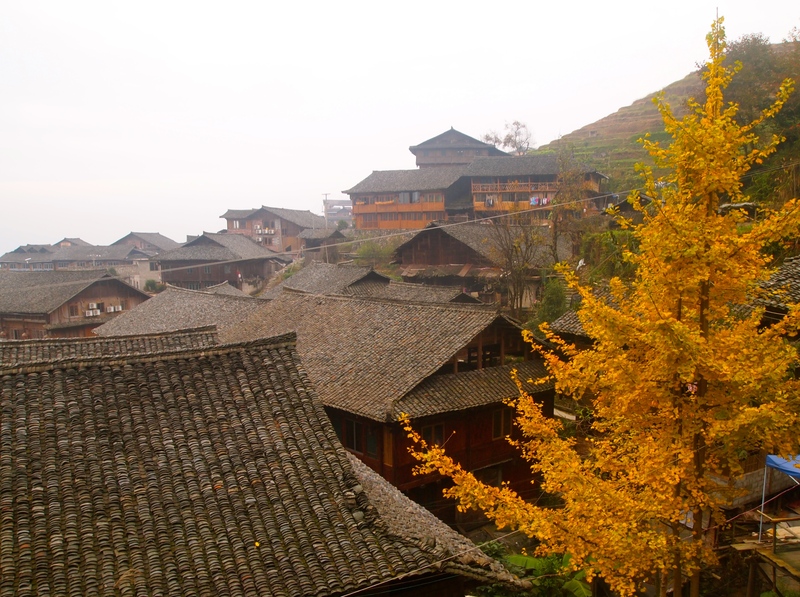 I love the rooftops of the Zhuang wooden buildings. And I see a touch of fall colors in the yellow trees. According to China Highlights: Guilin, in Guangxi Zhuang Autonomous Region in the south of China, enjoys a subtropical monsoon climate. The average temperature is approximately 20 degrees all year around. 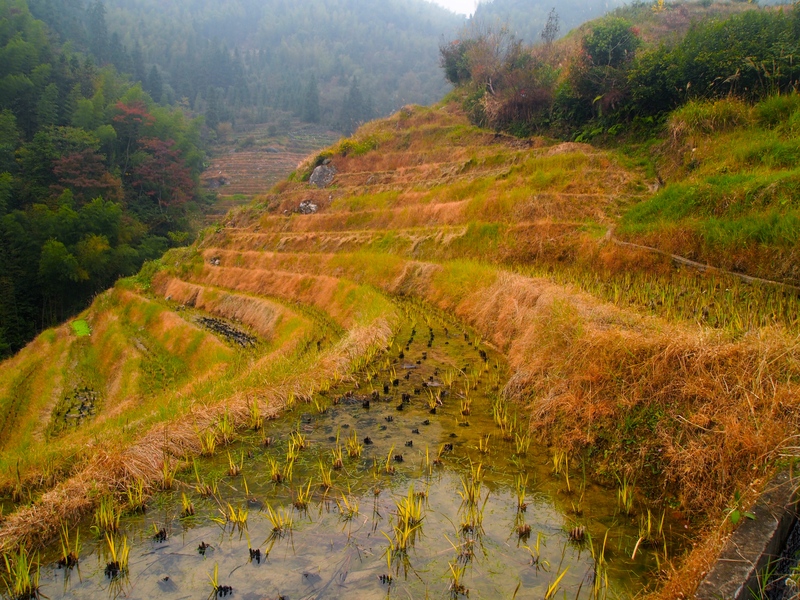 In the terraced areas, the farmers grow rice twice a year. 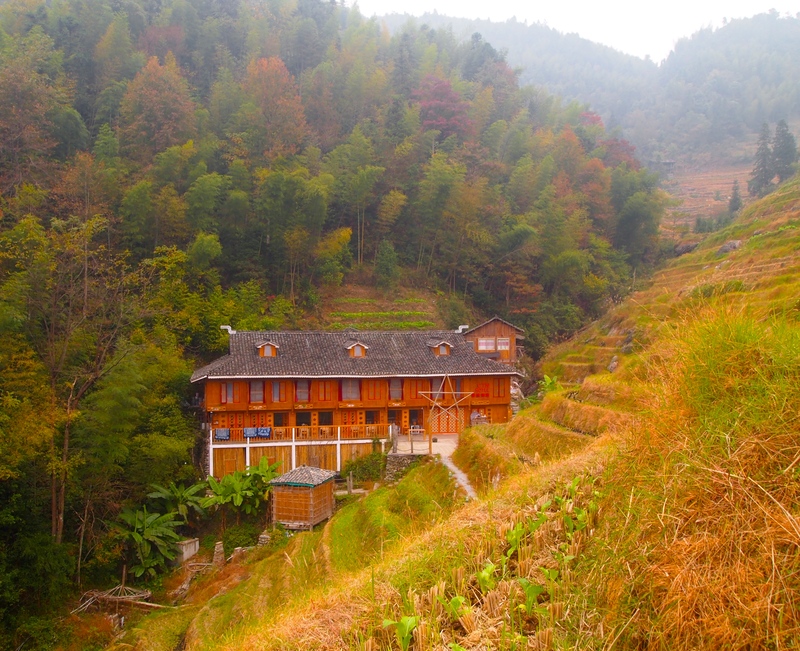 However, due to the high altitude on the Longji Terraced Fields in the deep winter time, the temperature can be below zero. The local farmers only prepare the cultivation once a year. 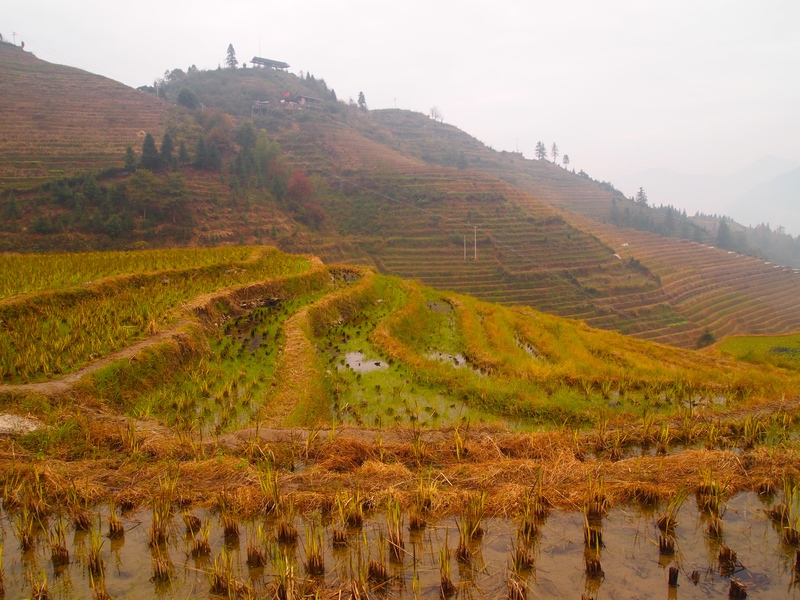 In late April, it is time to fill the rice paddies with water. The terraced fields, filled with crystal clear water, look like thousands of silver ribbons glittering in the sun. 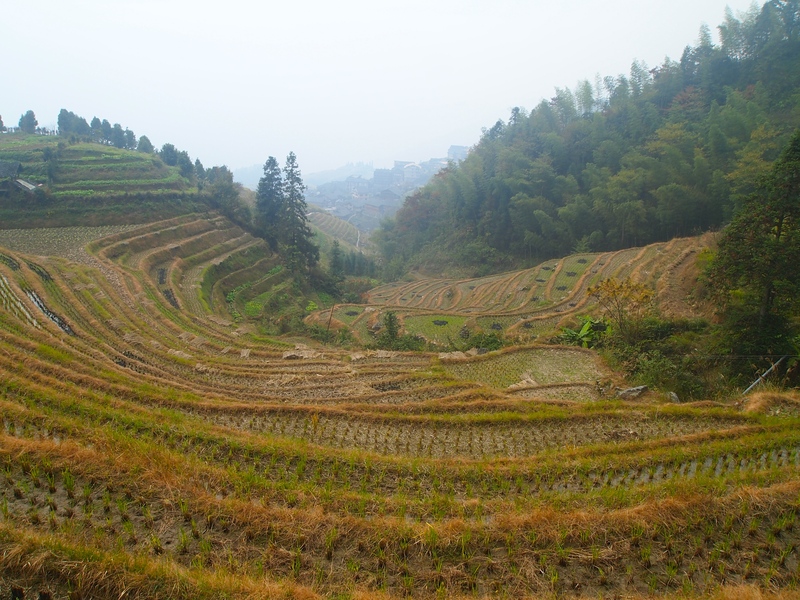 In summer time, the grain seedlings have green leaves which make the entire terraced area look like a green ocean. 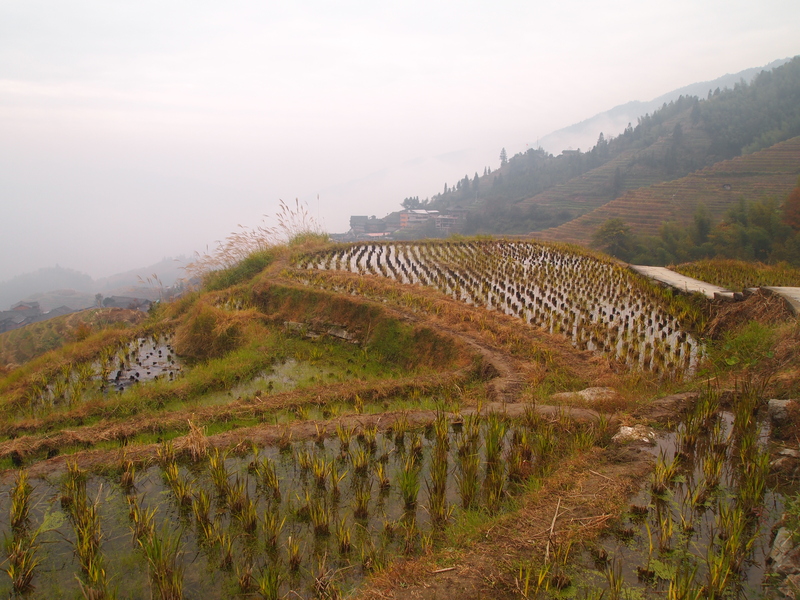 In late September and early October, the rice in the paddies is ripe. 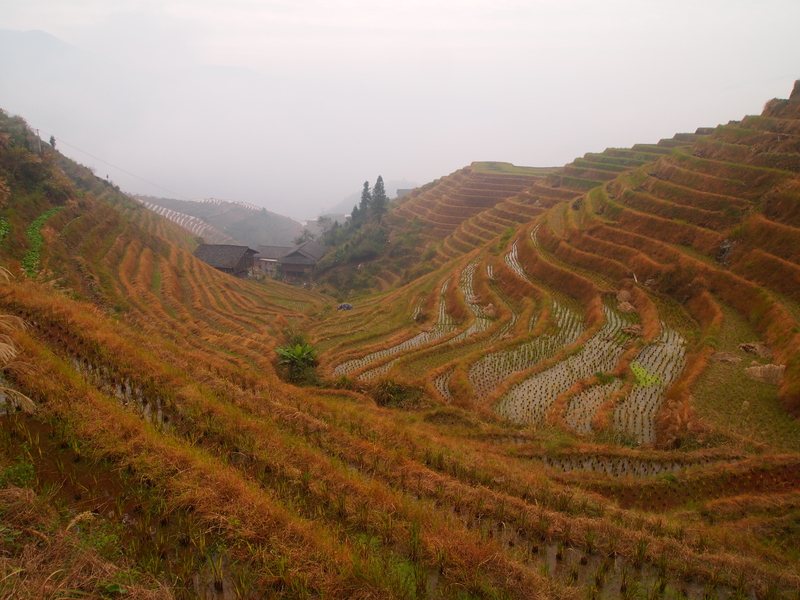 Each layer of the terraces looks like a piece of precious golden carpet. During National Day, you are able to see the farmers harvesting rice in the fields. From November onwards, it’s winter. Normally, the farmers don’t grow anything and just let the fields have a good rest. 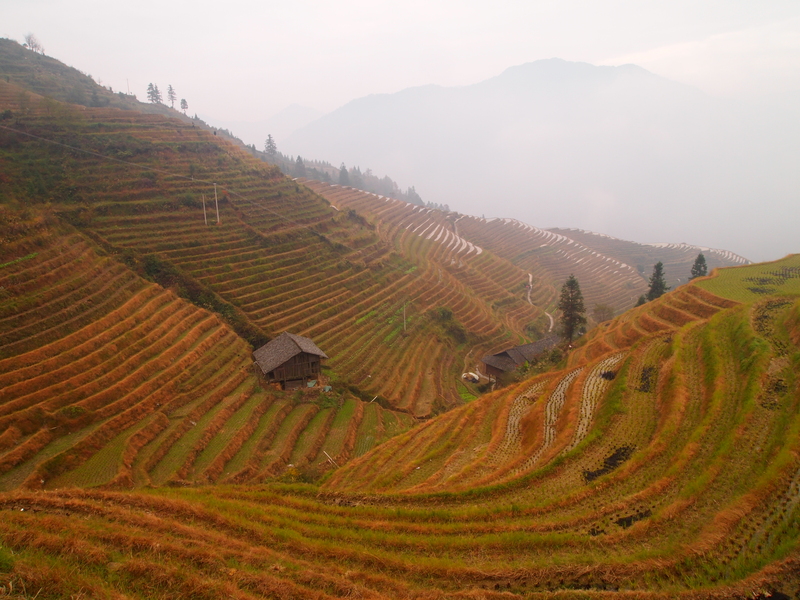 So the best time to visit the Longji Terraces is from April to October. 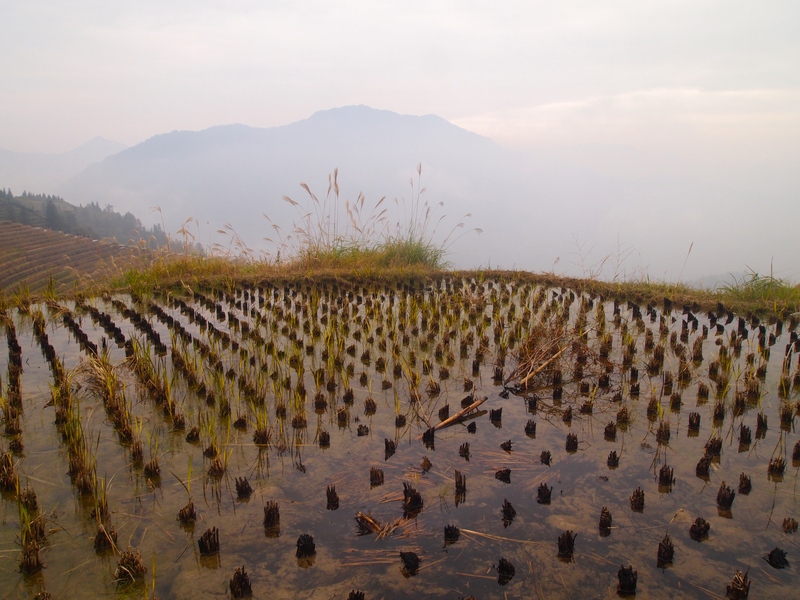 Of course the rice fields have all been harvested by now, so this is not the best time of year to visit. 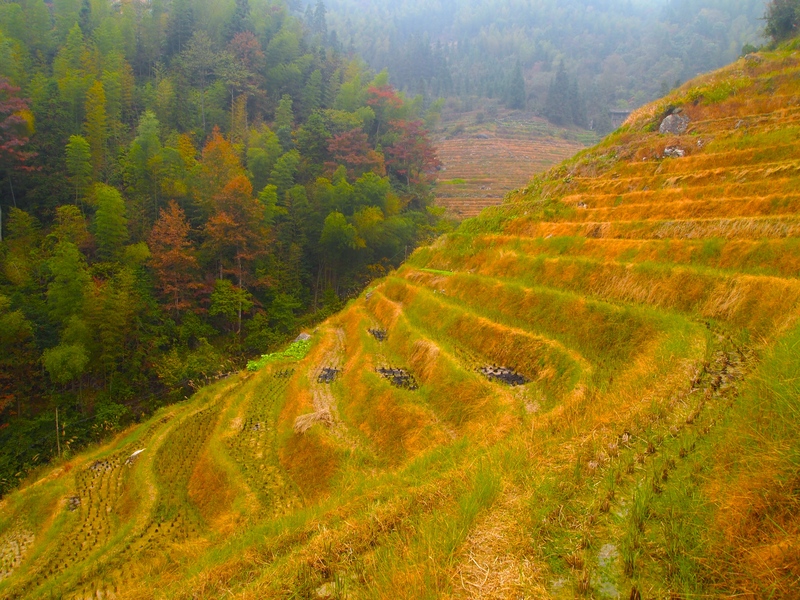 However, I do find the terraces with their golden colors quite pretty. It’s pretty foggy and overcast today, so it’s not the best atmosphere for photos either. Nevertheless, I still find the scenery breathtaking. The walk is all uphill and I have to stop many times to bend down and touch my toes to stretch out my back. My little lady guide is very patient and kind, and gives my lower back a rub when I stop. She doesn’t speak much English but she can say “beautiful! !” “a long, long way!” and “water” which she keeps repeating throughout the walk. 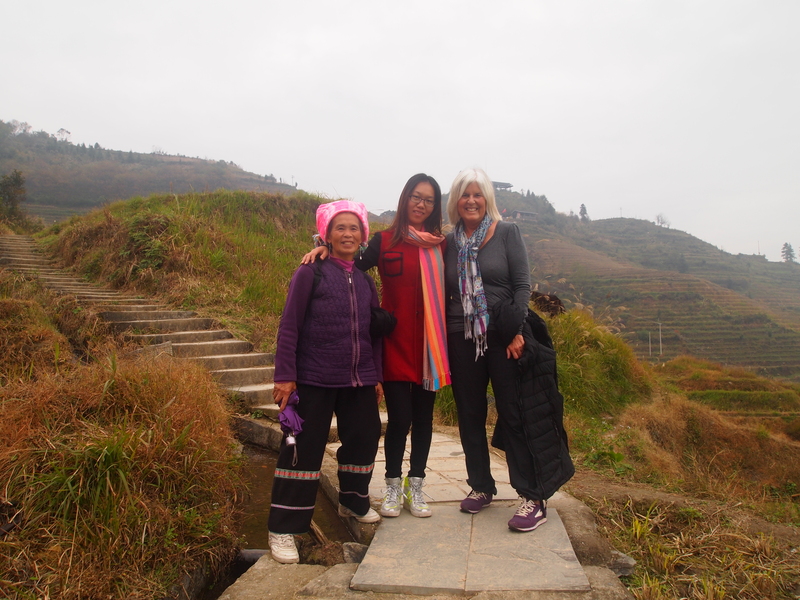 Of course, in typical Chinese fashion, some fellow tourists want me to pose for a picture with them. Whenever the Chinese ask to take a picture with me, I ask whoever is taking the picture to take one with my camera too. 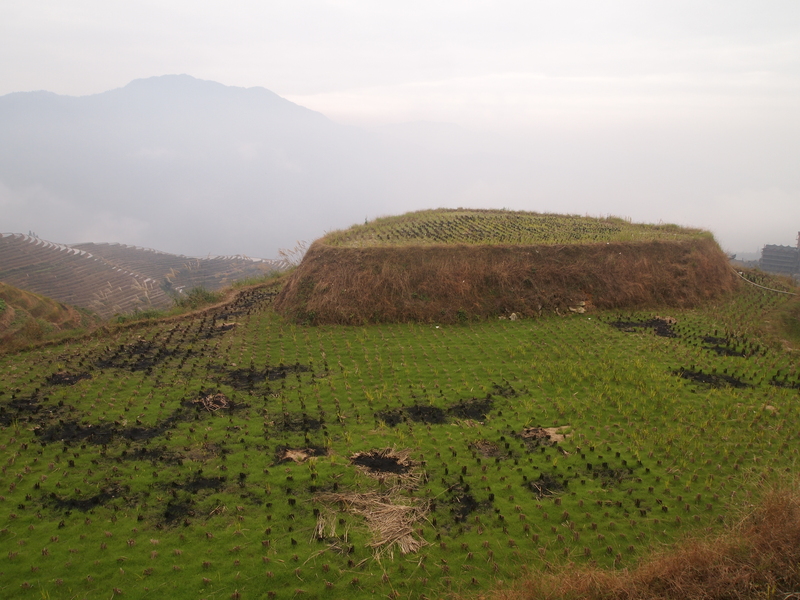 Some of the rice on the terraces has been burned and during my hikes, I see a number of burns taking place. You can see the black patches in this photo. I like the clouds reflected in the water-filled terraces. The scenery is breathtaking. I of course have to stop every couple of minutes to take photos of the contoured landscape. The first viewing point is “Nine Dragons and Five Tigers.” The name means the nine ridges look like nine dragons branching off from the main vein. 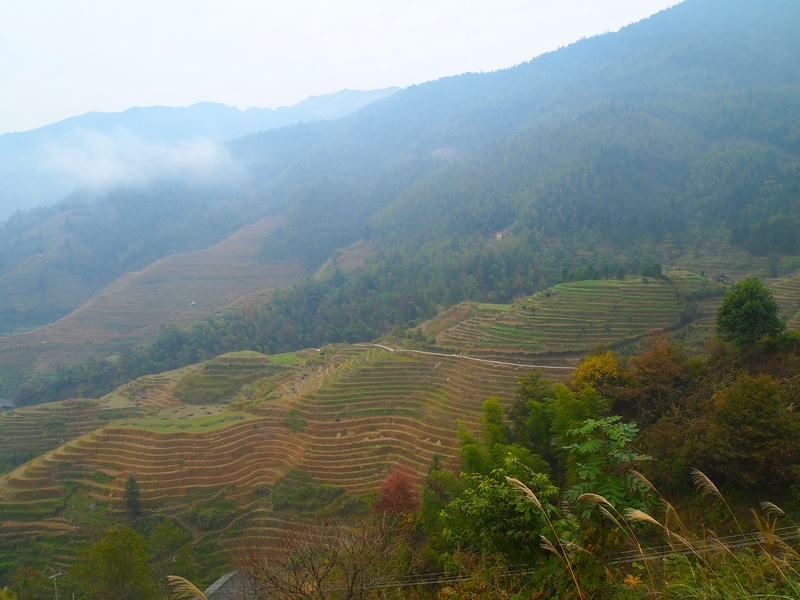 Alongside, there are five tiger-like piles, guarding the peaceful village. 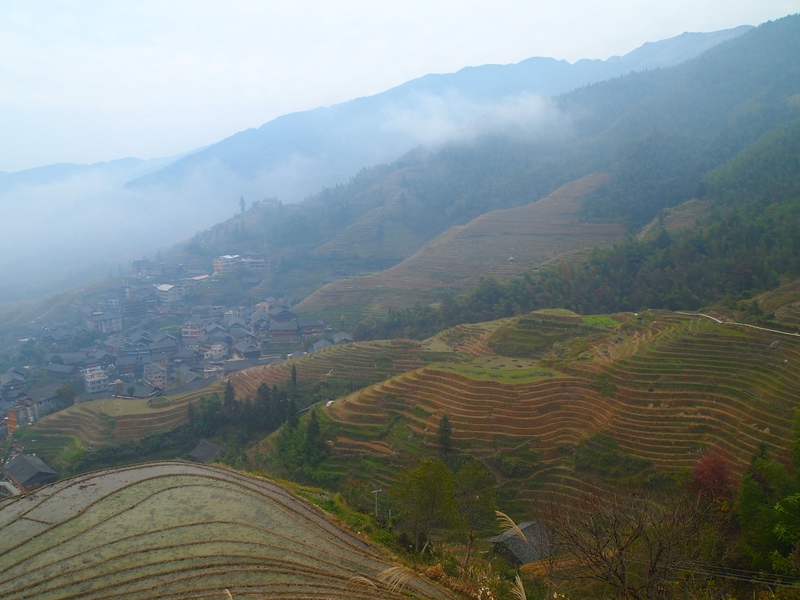 Both of the two scenic spots are the best places to get a bird’s-eye of the Ping’an Terraced Fields. We will head to Viewpoint 2 after this one. That will follow in another post. We turn around here at Nine Dragons & Five Tigers and head in a circle toward the second viewpoint, on the opposite side of Ping’an Village. 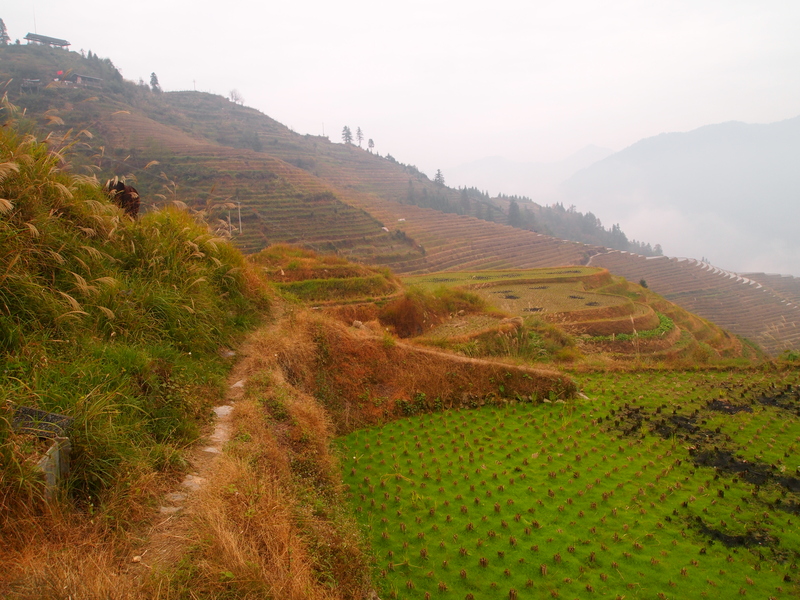 Apparently if you continue along the path from here to the east, it’s a four-hour hike each way to Dazhai Village, another village at Longji Rice Terraces. 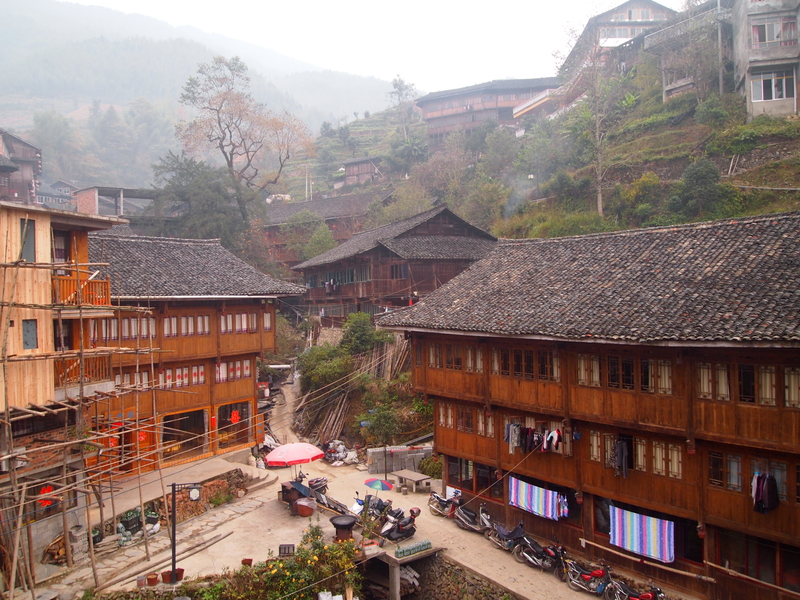 If I head to the west, from Viewpoint 2, I can go on an hour-long hike (2 hour round trip) to Longji Ancient Village. I plan to do this tomorrow if I can get some rest this afternoon and if my back feels better. 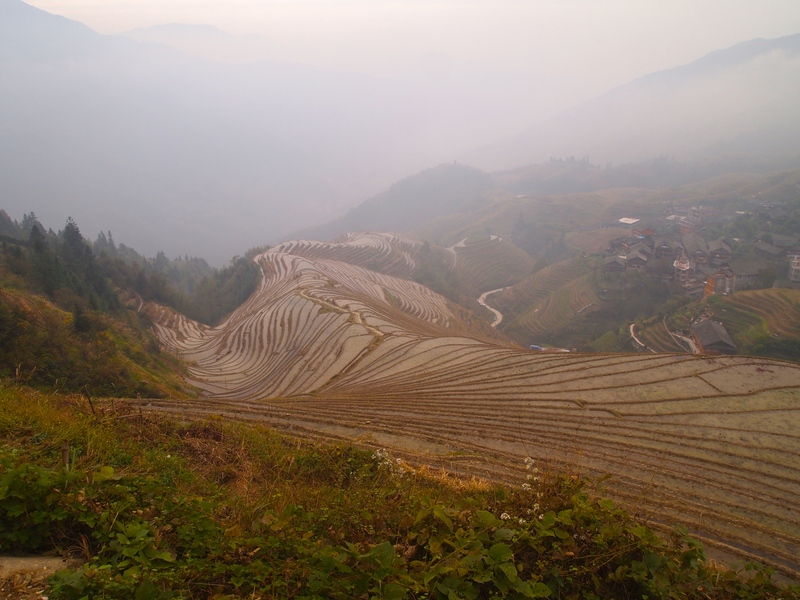 You can see the path through the terraces in the photo below. 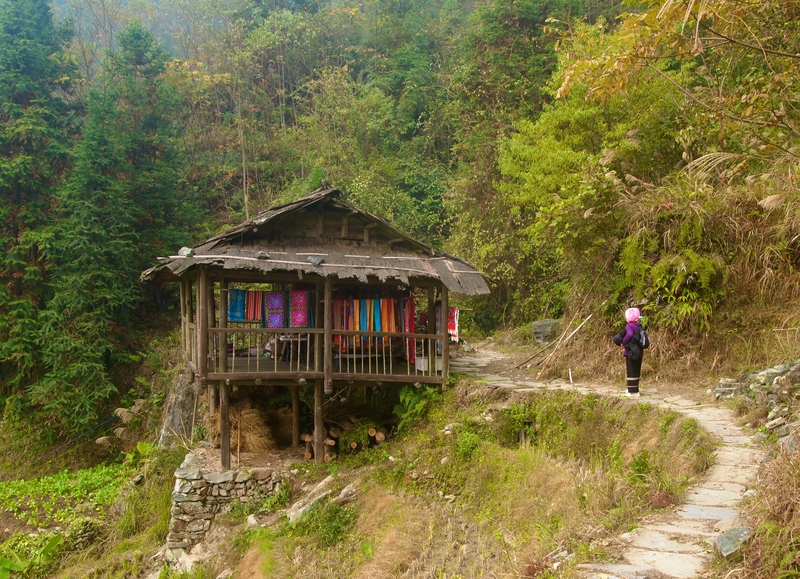 We approach a little wooden structure perched on the mountainside, where a Yao woman is selling some scarves and handicrafts. 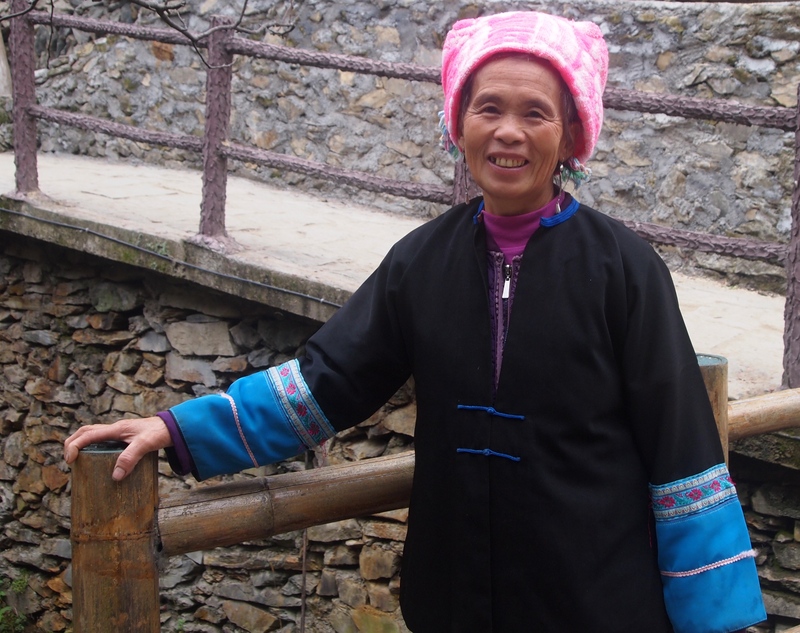 The Yao people in the village are distinctive from the other residents because of their hair. 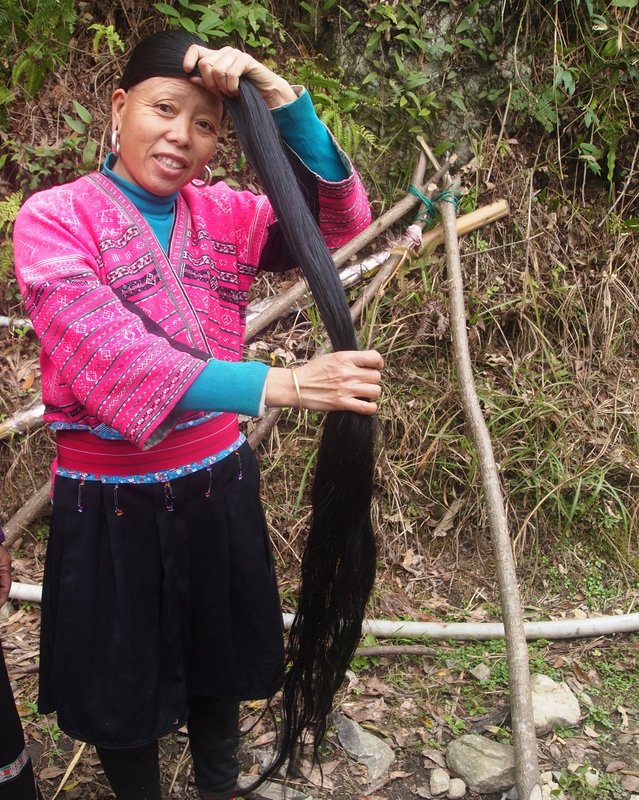 All of the Yao women in the village have long hair; with the longest being over two meters. 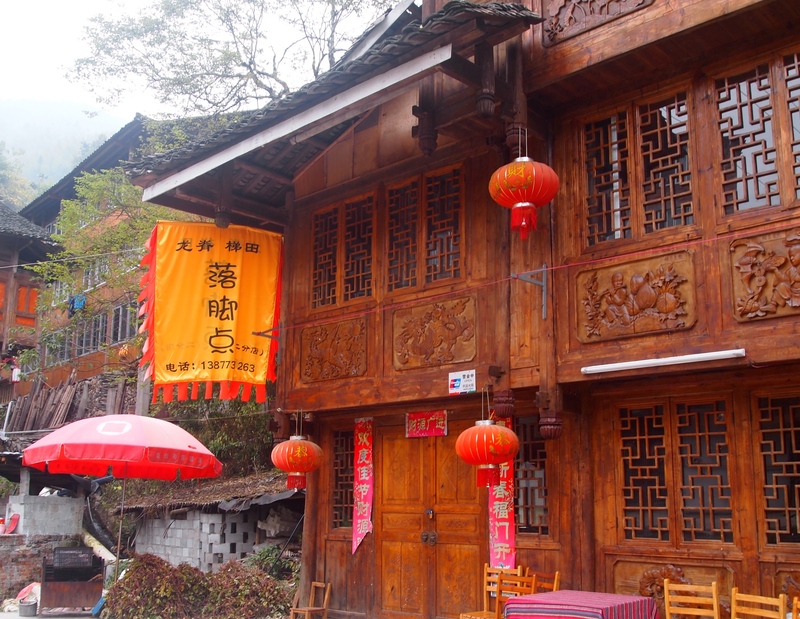 Huangluo Yao Village, which is on the way to the Ping’an parking lot, was listed in the Guinness World Records as the “World’s First Long Hair Village”. 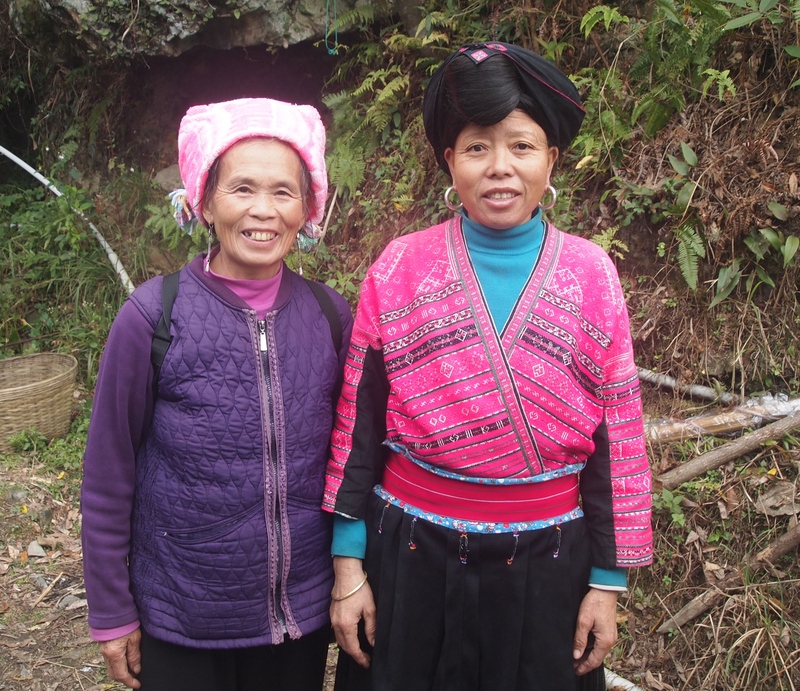 It is said that all of the Yao women in the village only cut their hair once during their lifetime and that’s when they become adults (18 years old). Apparently, there are three bunches of hair on their head. The first bunch is the natural hair growing on their head. The second bunch is the hair which was cut off when they were 18 years old. 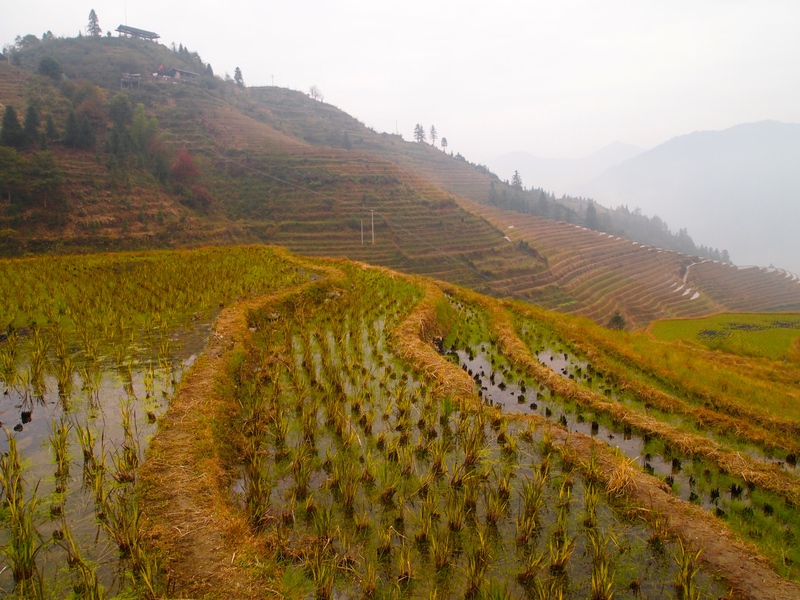 The third bunch of hair comes from the hair which falls out when they comb their hair daily (China Highlights: Longji Ping’an Terraced Fields). 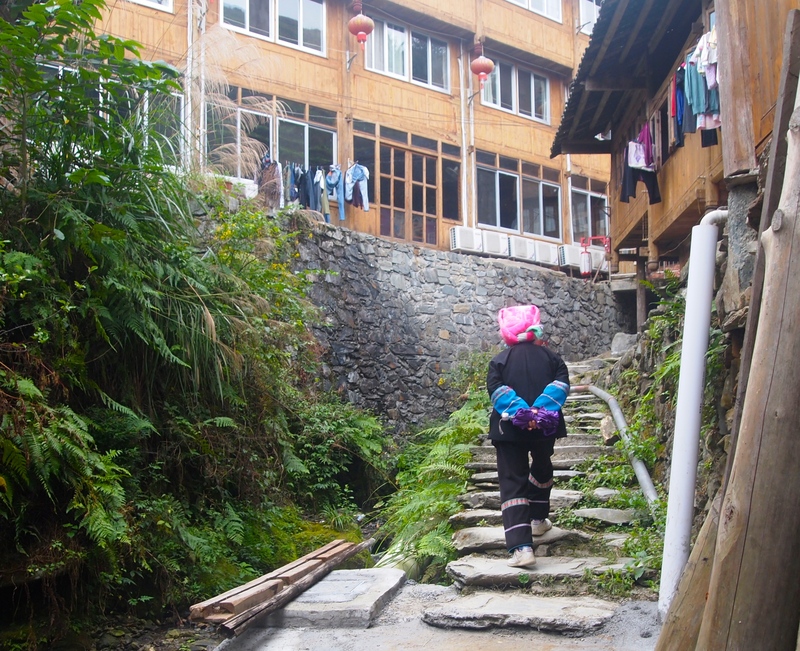 The Yao woman tells me she’ll show me her long hair for 20 yuan, 10 for her and 10 for my guide. How can I not take her up on it? She also has the other long strand of hair that she cut when she was 18. I don’t take a picture of that strand, but she somehow wraps that up with her normal hair into the bun she wears at the front of her forehead.